BUENOS AIRES, Argentina (AP) — A day after bombs ripped through Brussels, President Barack Obama declared that fighting the Islamic State is his "No. 1 priority" and pledged that the United States will pursue the jihadist group until it is destroyed. "I've got a lot of things on my plate, but my top priority is to defeat I ISIL and to eliminate the scourge of this barbaric terrorism that's been taking place around the world," Obama said Wednesday. "There's no more important item on my agenda than going after them and defeating them. The issue is, how do we do it in an intelligent way?" 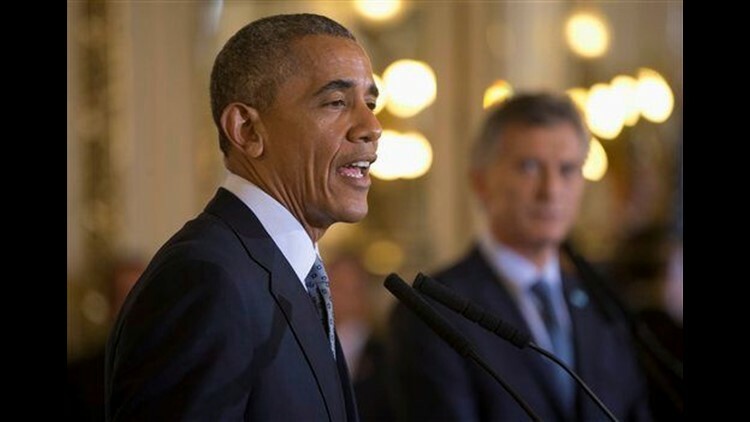 Obama addressed Tuesday's deadly attacks in the European Union capital during a news conference in Buenos Aires, where he is meeting with the country's new president, Mauricio Macri. Obama said both the U.S. and Argentina understand the sorrow felt by the Belgians "because out countries have felt the scourge of terrorism." He called on the world to unite behind fighting what he called "senseless and vicious" acts. The dual attack at a subway station and the airport killed at least 34 people, including three suicide bombers, and injured 270 others, authorities said. Obama criticized Republican presidential candidates who have suggested they would "carpet bomb" the Islamic State. He dismissed that approach as both "inhumane" and counterproductive. "That would likely be an extraordinary mechanism for ISIL to recruit more," he said.